Trainers - Do It Yourself - Articles - SMS Power! You can make your own trainers by using selected tools to hack/modify the original SMS ROMs, and it is a fun and, at times, challenging endeavour. There is no universal way to do it, and ROM hackers have various preferences with regards to tools and approaches. This section is written by SMS Power! user hang-on, in the style of step-by-step instructions interwoven with a personal narrative. I'm not a coding/computing authority, but I believe I have a healthy interest in tinkering with the SMS-games. The narrative format allows me to present my findings as personal experiences gained from having hours of fun with games and tools of the console from my childhood. These experiences are written up as steps and recommendations, to provide clarity for the reader, and to make the text function as a kind of tutorial, that might inspire others to embark on making their own trainers out of the good old SMS games. The approaches taken and described in this guide, might not be the most simple or straight forward ways to achieve quick patches like unlimited lives etc. My motivation for hacking ROMs is not only the pleasure of enabling trainer features by patching some isolated bytes (but this IS also a major thrill for me). As a child, I did spend a lot of time wondering about how my SMS games where made, how the console worked, etc. Now, as I'm coming back to all this SEGA 8-bit stuff after 25 years, hacking the games is more like a practice of reworking some of the great mysteries of my childhood. So I'm fuelled by a passion for exploring the inner workings of the games. I'm set on both process and product here. It is assumed that you know a little about hexadecimal numbers, the workings of the Z80 inside the SMS, etc. For an excellent primer on SMS programming and essential info on hex numbers, opcodes, etc., please refer to Maxim's programming tutorial for the SMS/GG. It is also assumed that you have access to copies of the ROMs you are going to hack. This guide will demonstrate how to create a trainer for Altered Beast. A zip file with .asm source code and .ips patch for the total Altered Beast trainer project is located towards the end. Inspired by the definition of "a more accomplished trainer" given in this this document (not written by me), I went on from Altered Beast and created a trainer patch for Golden Axe. This patch includes a demo screen with animations and music, and a trainer menu to turn cheats on and off. Thus below the Altered Beast trainer D.I.Y. tutorial, I have included some notes and a download link for the Golden Axe trainer. I have tried to comment the source code in a fairly detailed way. Contact me (hang-on) if you have got any comments or questions. Edit: The following descriptions of workflows involving the Emulicious emulator are outdated. These days (2018), Emulicious will nicely disassemble the rom for you. No need to do all the workarounds involving Firefox etc. Thanks to Calindro for keeping this Emulator updated and in top shape! This section contains notes on some of the various tools that can come in handy when creating your own trainers. Meka - an emulator with comprehensive debugging functionality, and a very useful cheat finder feature (if you grab the latest version still under development). Emulicious - an emulator with a set of features particularly useful for ROM hackers. At the time of writing (October, 2013), some of the features I utilize is still in development, and thus not part of the official Emulicious release yet. Please refer to the Emulicious thread for more info. SMS Checker - a program that can identify and remove unwanted headers in your ROMs. FrHed - a hex-editor to punch your modifications into the original ROM. WLA DX - an assembler with a particular handy .BACKGROUND directive. Everdrive - a flash card solution that allows you to play your modded ROMs on real SMS hardware. SMS Power! Development forum - the place to ask questions when you get stuck. SMS Power! cheat sections for each game - for Action Replay Codes that you might want to build your trainer around. See for example the cheats for Altered Beast. Gamehacking.org - a rather comprehensive database of Action Replay Codes etc. 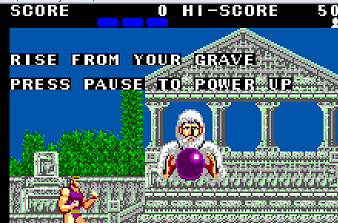 Alter Zeus' command at the start of the game, so that he says "Rise from your grave. Press pause to power up"
Screenshot of Zeus informing you about the pause button power up feature! To get in the right mood for modding this classic SEGA game, I strongly recommend that you spend a few minutes watching how someone must have struggled with porting it to an inferior 8-bit console back then. Oh yeah, it is time to get to work. First step is to make sure your ROM is healthy and clean. This is mainly to avoid confusion with unauthorized headers put on by some older copier devices back in the days. If the ROM contains this kind of header, the ROM addresses you see in the debugger, will not correspond to those you want to modify using in the hex editor. This is because the debuggers and emulators tend to ignore those unauthorized headers, but the hex editor shows you the raw file as it is. My Altered Beast ROM is a file on my computer called "Altered Beast.sms". In the rest of this section I will refer to it just as the ROM. I open SMS Checker, and point it to the directory containing the ROM. Then I click Scan. I'm going for a "Good dump", in which case I can proceed directly to step 2, but it turns out my ROM is head/footered! Then I click Fix, confirm my intentions in the dialog that opens, and tadaa, it is now of type "Good dump". Now that I know that my ROM is in good, hackable condition, it is time to proceed to next step, and that is searching the web for cheat codes. Sometimes it is necessary to use a debugger like Meka to establish a cheat code for a given game. At other times you are fortunate enough to be able to draw on cheat codes found by others in the community. To support the SMS Power! community, I recommend that you first step by the "Games" section here. From the front page, click on "Games" > "A" under Master System > "Altered Beast". Now you will be at the general information page on Altered Beast. Click the "Cheats" links in the right hand sidebar, and you are transported to the cheat page for Altered Beast. This page displays various cheats, but what I'm after is the so-called Pro Action Replay codes . The Pro Action Replay (PAR) is a cheat cartridge that was made for the Master System and Game Gear. It sits between the cartridge and the system and offers the user the ability to search for, and apply, RAM patches. These RAM patches work well as a starting point for debugging a ROM to create your own trainer. (there are other PAR codes for Altered Beast). The anatomy of a 8 digit PAR code: 1) Forget about the two leading zeroes. 2) The next four digits is the RAM location to be patched. 3) The last two digits is the value to be written (patched) to the specified RAM address. For example, you can interpret the infinite lives PAR code (00C08F03) like this: It tells the Pro Action Replay device to constantly write the value 03 to RAM location C08F. From this we can guess that unlimited lives, in this case, means having always 03 lives. The most important thing learned from this code is the RAM address (C08F); we can assume it is the place where the game stores the number of lives left. Note: You can check this thread on how to use the Cheat Finder feature of Meka. Good feature to be familiar with in those cases where you are not so lucky that you can just look up the codes. I create a new folder and put the ROM into it. I rename it "altbeast.sms" for simplicity, and because I do not trust filenames with spaces in them. Then I open the ROM in Emulicious, and in the "Tools" menu I click "Create Disassembly". This populates my altbeast folder with an .asm file (containing the disassembled parts of the ROM), a .link file and 19 .inc files. Then I open the .asm file in Firefox. I believe this is a good way to view the disassembled ROM, without being tempted to alter things and create confusion. I keep the ROM open in Emulicious, as I might need Emulicious' handy memory tracer features, which assists you with regards to guessing from where in the ROM tiles and sprites are drawn onto the name table or into the tile generator. In Firefox, I open two tabs that supports my attempt at learning the Z80 instructions set: The first is a nice reference where you can click on each instruction and get details about how it works. The second is all the opcodes on one page, and I use it if I sit with the raw hex codes and do not remember what, for example, 0C means. So the disassembled ROM in one tab, and two tabs with reference material. I would like to mention SMS Power! 's own list of Z80 opcodes - it is very good! I also open the ROM in Meka, as this is my favorite debugger. It has a full memory viewer that can view both RAM and ROM (among other things), you can set breakpoints, and even utilize the handy cheat finder feature, in those cases where you are not so lucky that you can draw on cheat codes already reported. Isolated functions, addresses etc. I discover while debugging with Meka, are easily put in context with the disassembled code which is view- and searchable in the Firefox window (as discussed in the paragraph above). I use the regular Windows notepad for keeping notes about my findings on addresses in RAM and ROM. Lastly, I open the built-in Windows calculator, and set it to "Programmer" in the "View" menu. I also keep Frhed the hex editor close if I need to inspect the ROM as raw hex codes beyond the scope of Meka's debugger. Copy and paste the information about memorymaps and rombankmaps from the disassembled code displayed in a Firefox tab to this new file. Add the line "DEFAULTSLOT 2" under the line that says "SLOTSIZE $4000"
Add the directive ".BACKGROUND "altbeast.sms"" (or whatever your ROM is named), to tell the assembler that we will be overwriting parts of an existing ROM. 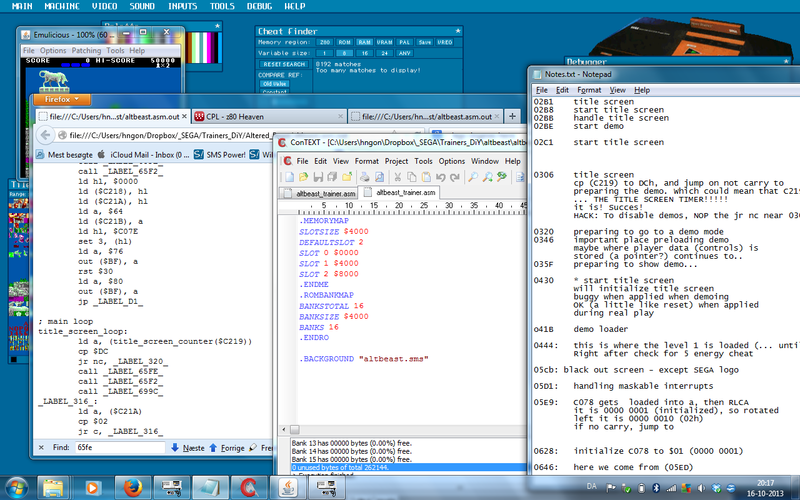 From the drop down menu on the toolbar (where it says "Text file"), you select "WLA-Z80 Assembler". This will help you with formatting. Click save. I choose "altbeast_trainer.asm" as the file name. You can check that it assembles well in WLA-DX if you press F9 (still assuming the recommended setup as described by Maxim). Please note that you are not making any changes to the ROM specified in the "BACKGROUND" directive. F9 is set up to assemble the .asm file into a file called "output.sms". At this point the output.sms is identical to the altbeast.sms, since we have not (yet) done any coding in Context (apart from the assembler directives). 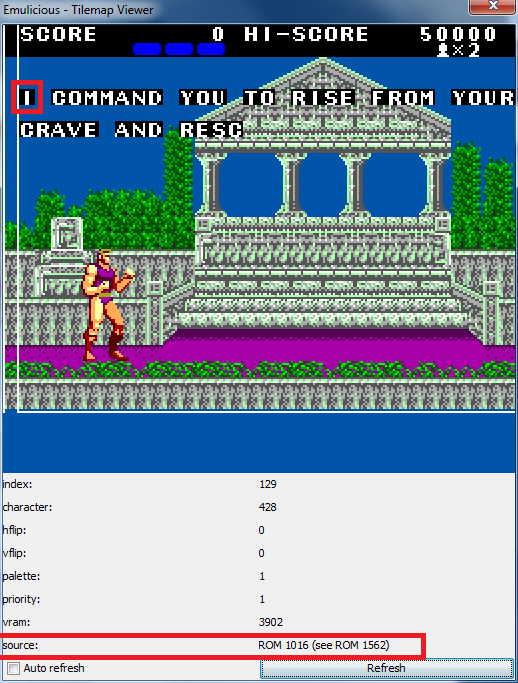 You can load output.sms into your favorite emulator to see for yourself that this is, for now, the unchanged Altered Beast game. With all this set up, we are ready to begin reverse engineering Altered Beast. 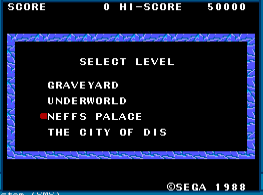 As described above, I have already got the memory location containing the number of lives - it is C08F. Before I do any modifications in Context, I want to examine the game in Meka to get to know more about how and where in the ROM the game deals with the players' lives. In Meka's memory editor I can also poke changes directly into RAM and ROM, and thus test modifications before I code them using Context. I open the ROM in Meka, and enable the memory editor. I point the memory editor to location C08F in RAM, and start the game. As I get the command from Zeus, I can see in the editor that location C08F holds the hex value 02. When I loose a life on the second wave of skeletons, C08F gets decremented to 01 along with the number of lives displayed at the top bar in the game. I can even type in some values of my own, using Meka's memory editor. If I type 04 into the byte at C08F, I instantly get 4 lives in the top bar. This ensures me that C08F is indeed the container of the player's lives. The game breaks because HL at this point contains C08F. Studying the nearby code in Meka's debugger, and in the Firefox tab that displays the disassembled ROM, I get a sense of how the game handles the situation when the player looses a life. As it turns out (see screenshots), almost everything is nicely crammed into one function. You can view a screenshot from the Meka debugger, where I have marked the code responsible for decrementing the number of lives and writing the decremented value to the required RAM location (C08F). You can also view a screenshot of the disassembled code in the Firefox tab, where I have marked the 'loose life' function as a whole. Looking at the code above, I think a good way to achieve infinite lives is to stop the game from decrementing the value in register a. If there was no "sub $01" instruction happening, then the number of lives would be loaded from $C08F, the carry flag (for the ending procedure) would never be set, and the unchanged number would be put back into $C08F. Explanation: 0C80 is the precise location in the ROM, D6 01 is the hexadecimal representation of the two bytes of 0's and 1's that make up the instruction SUB 01h (which is the mnemonic for subtract $01 from the value currently in the register A). Meka uses 'h' to denote hex numbers. In Context, writing for the WLA-DX assembler, I use '$' to denote hex numbers. I'm sorry for the confusion. Anyway, to patch the ROM so that the SUB instruction never happens, I need to turn the two bytes (D6 01) into NOP's. NOP is an instruction that does nothing for 4 clock cycles. It is a 1-byte instruction, and the byte is 00. Please refer to the WLA-DX documentation for the full details. Briefly explained: .orga tells the assembler to put the assembled instructions starting at the address specified. In this case it is $0C80, which is where the two bytes of sub $01 start. I write a comment for clarification. The .db $00 $00 defines two bytes of $00 (the NOP instructions). These 00's will overwrite the D6 01, effectively enabling infinite lives by disabling the subtraction of lives. I assemble it with F9, test it with F10, and it works! I put it on my Everdrive and defeat the final boss just to celebrate. Haha - die, you evil lord of the underworld. It won't help you to turn into that rhino. You might recently have gotten some fame from being in Wreck-it Ralph, but you know who will win when it's down to just you, me and the patched ROM. ; I guess (it seems like $FF is used for marking unused bytes in the ROM). This patch effectively alters the behaviour of the pause button. Now you can power up at will (but you cannot pause the game... welcome to your doom, hahahaha!). One more thing: You can actually power up beyond the standard werebeast. The fourth or fith time I powered up the poor level 1 werewolf, he got the dragon's ability to electrocute enemies in his own, buggy way (he evens turns green - and then burning red when he attacks). Even though this buggy behavior is a little amusing, I have tried to put in some additional code to check the current state of transformation, and only releasing the power up if the player is not already a werebeast. Using the Cheat Finder in Meka (comparing to $00 > power up > comparing to $01 > power up > comparing to $02), I quickly located the byte that holds info about current state of transformation: $C24C. But I have not yet found a good way to implement this check-up, as I cannot find sufficient free space in the ROM. For now, I'll go with the free transform pause power up routine. (Note: At a later point in this guide, I will disable the demos, and use the space allocated for demo control, for my own sinister purposes, including a fix that prevents attempts at the third transformation). This patch does not improve the gameplay, but I like it anyway. In the absence of a demo style title screen for my trainer (refer to the beginning of this document on trainers), I want to let Zeus inform the player about the pause button power up feature. I enable the Memory Tracer in Emulicious. Then I start the game, and Zeus greats me the usual way: "I command you to rise from your grave and rescue my daughter". While Zeus' command is being typed, I open the Tilemap Viewer. When I (using the mouse) point to the tile representing the first letter ("I"), Emulicious tells me that the source ROM location is 1016h. 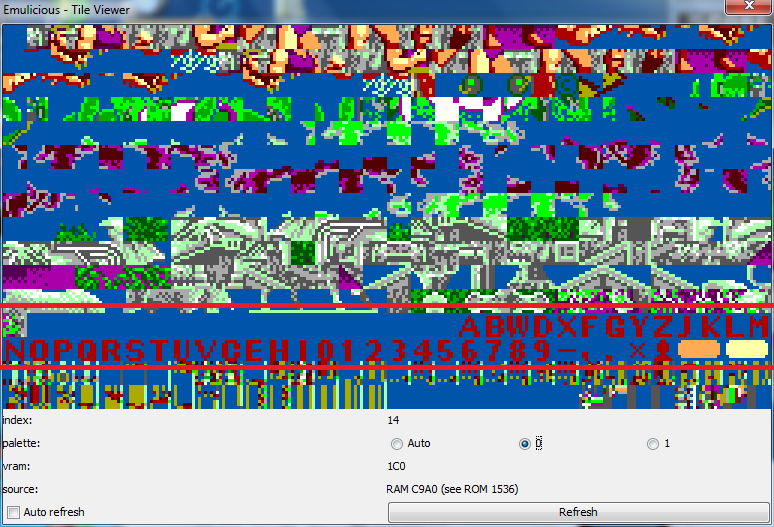 The source means the address of the byte in ROM that was copied to this particular position at the tilemap. In this case it seems that the string of letters making up Zeus' command starts at ROM location 1016h. In order to alter the message, I must know the codes for all letters. Going back to Emulicious I open the Tile Viewer, where the letter tiles (characters) are visible in the bottom half. I point the mouse over the "I" tile, and learn that it is at index 428. The first letter in the character set is "A", and it is at index 403. 428-403=25; which is 19h (hexadecimal). From the peeking done using Meka, I know the letter "I" has the hexadecimal code ACh. I can calculate the code for the first letter ("A") this way: ACh-19h = 93h. Update: Silly me. I was blessed by a moment of sudden clarity, and I saw how the index number 403 is of course 193h (hexadecimal). Reading about this stuff in the Sega Software Reference Manual http://www.smspower.org/Development/OfficialDocumentation/ made me realize this, and also that the third hex digit (the 1) is added because I'm dealing with the tiles in the bottom of the tilebank (also called the character generator in the reference). The Meka tiles viewer comes in handy here, as I can use it to directly read the hex index values of the individual tiles. If the tile index is 193h for a given tile, the one-byte version of the index is simply 93h (refer to the table below). I you want, you can double check with the table that this is correct. Or even better: You can assemble the .asm file (F9) and run it in Meka (F10) to see (hear?) for yourself what Zeus has to say! Rather than making a separate demo style custom title screen, I want to work with what I got in the ROM as far as possible. I've got Zeus informing the player about the power up feature, and I also want it to be clear from the title screen that this is a trainer version of Altered Beast. Altered Beast is very quick to proceed from the title screen to one of the preset demos. I feel a need to make the game stay at the title screen until the player press a button. Using Meka, I reset the game, to make the title screen appear. Then I press F5 to save state. Now I can scroll through the memory editor while pressing F7 to load the saved state (effectively restarting the title screen over and over). I'm looking for some kind of counter that I'm guessing the game uses for 'knowing' when to switch from title screen to demo. So I'm looking for a value that either increments or decrements rapidly/steadily during the title screen. At this point, I'm getting into some trial and error, as several RAM addresses looks like the counter I'm after. I examine them one by one in Meka by breaking on reads/writes to the given address. I also examine them in the disassembled code in the Firefox tabs, searching (Ctrl+F) for the RAM address in question. This allows me to jump between functions that refer to the given RAM address. ; only the flags it would have set/reset if it really was subtracted. Explanation of CP opcode comes from Z80 Heaven . From the code above I learn two useful things. First I know now where to apply a patch in order to make the game never leave the title screen for a demo (I can overwrite the jump instruction). Second I know the location of the demo handler (320h), and if I'm going to disable the demos, this is instead to be treated as a source of unused bytes at my disposal (keeping in mind that I ran out of space for a good quality pause button hack). At the title screen the words "PUSH START BUTTON" flashes below the game's title. I want to change these words to "x TRAINER x" in order to advertise that this is a trainer version of Altered Beast. This is a little different from creating and prepending a demo style custom title screen (refer to the beginning of this document on trainers). The demo style custom title screen is also a very good idea, but modifying the game's original title screen, forces me to spend even more time learnng about how the game is set up, which has intrinsic value for me (at least in this case of Altered Beast). It also brings certain extra constraints and possibilities, which is a good thing for me. Instead of importing graphics etc., I'm tempted to focus more on the tiles the game has already loaded at this given point. I present some notes and main points, to go with the (commented) source code for the patches described above, and for the coding I've done in order to create a level selection menu. I also touch upon how I have used the space, that was originally reserved for the code that handles the demos, to improve the pause button hack beyond the bugs mentioned. The source code is attached as an .asm file at the end of this document. I have appended 32 kb to the original ROM. In my experience, the Everdrive and some emulators have trouble with ROMs not meeting specific demands with regards to size. Even though I do not (at this time at least) need all of the 32.768 extra bytes for code and data, I believe my Everdrive needs the bytes to handle the ROM correctly. I open the original ROM ("altbeast.sms") in Frhed, the hex-editor mentioned earlier. I press Ctrl+P, or click Edit > Append... in the menu, and then input 32.768 when asked for the amount of bytes to append. Then I save the expanded ROM under a new name; "altbeast_32.sms". Remember to adjust the WLA-DX .background directive in Context accordingly. These new values reflect that we have appended 32.768 bytes, which is $8000 in hexadecimal. With a bank size of $4000 (as we can see directly from the rom bank map), this corresponds to adding two additional banks (from 16 to 18). Edit: I'm having trouble with my Everdrive and this game. Everdrive seems to require ROMs to fit into a power of two file size. So in the version attached for download below, I have expanded the ROM to 512 kb (32 ROM banks). I state this here just to avoid confusion. When I disabled the demos in the patch earlier, I also cut the connection to the code used for handling these demos. As long as the demoes remain disabled (I do not intend to put them back on), I am free to use the bytes occupied by the demo handling code for something else. From debugging the title screen in Meka, and comparing with the disassembled code that Emulicious produced, I have found out that a fair amount of bytes, starting from address $320, is thus open to my custom use. I redefine that section to house the custom pause button hack, improved to include a check of the variable that contains information about the current state of the player (so that you cannot power up if you are already a werebeast). The section also houses a custom routine that saves the current page number in a seemingly unused byte near the stack, in order to facilitate a seamless call to a function located in the bytes appended to the original ROM. Upon returning from this function (it is the level select menu), the old page number is loaded, and control is given back to the original code. Please refer to the source code provided. I have tried to make comprehensive comments and labels. Edit: (dec. 15th 2013) An optimized version of the code for the Altered Beast hack is now available. See the download link below. Various delays replaced with calls to a wait for VBlank routine. Click here to download the optimized .asm file. I have used the same tools, workspace and techniques as described above, to make a trainer for Golden Axe. I have included .asm source and .ips patch below. I will not go through every step, but I have tried to comment richly inside the .asm file. Contact me by PM or on the forums if you have questions or comments, I would be happy to help. For me, the thrill of creating this Golden Axe trainer was not so much to actually locate and tweak selected bytes in ROM, but more working with (and learning) some basic building blocks of Z80 assembler programming to create an animated demo screen with sound, and a trainer menu where you can enable or disable the various cheats/trainer features. It uses the ROMs own music handler and sound data for tunes/sound effects. It has an animated demo screen before the original title screen of the game. This demo screen is located in space appended to the original ROM. 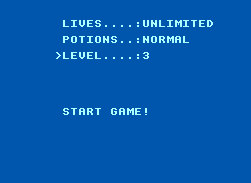 From the trainer menu you can enable unlimited lives, potions x 2, and select the level to start from (and also listen to the background music from the different levels). I knew I wanted music on the demo screen. I remember the old days, over at my friend's house playing his Amiga, enjoying the demo screens of the various games. Well, less would have to do, as my skills are limited. Anyway, this was the opportunity for me to dwelve into the PSG chip of the SMS. I read some of the documents, experimented with Martin Konrad's music tracker software, and eventually came to a point where I could play some music from a blank screen 'game' on the SMS. In the process I learned about how the interrupt handler will call a function something like "play_next_note", that will... ahem, play next note. And also that a function initializes the PSG and sets up track data to be loaded into the PSG port one note at a time. I thought about the benefits of hi-jacking Golden Axe's own music handler functions: Not only would the world be spared of my desperate attempts at creating chiptunes (as I could play tracks and sound effects already included), but I could maybe include a kind of sound test as part of the trainer features (where you can play back each level's soundtrack). Emulicious had disassembled the game for me, so I had a few Firefox tabs displaying this disassembled code. Switching between Meka memory viewer, disassembled code in Firefox, and the regular Windows notepad, I started from Golden Axe's interrupt handler, and worked my way backwards towards the music handling part of the code. This part of the process was pretty low tech but hard work: I simply traced (in the Firefox tabs displaying disassembled code) all calls recursively until I eventually was sent back to the interrupt handler. In the end, I had a notepad full of addresses all relating to each other, within a certain part of the ROM; the part that contains functions related to music/sound handling. I did this to confirm that all music handling was done in one bank (it was), and to learn about some key variables needed to be in place to support a play-note like function on an interrupt basis. I expect my actual code for the demo screen to give away that this is my first attempt at working with sprites. 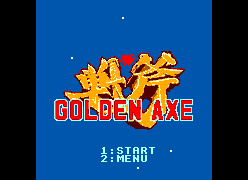 I found the Golden Axe kanji logo on the internet, and edited it in photoshop to fit into 8 x 8 tiles, and a limited amount of colors. Then I used BMP2Tile to process the image from png to a collection of files for inclusion into my project: data for the tiles, the tilemap/name table data and the palette. At first I had a wild fantasy about building the logo with sprites, and having a clouded background as.. well, a background. Just like the arcade version, then the background will scroll vertically, giving the impression that the logo is flying. Reality caught up with me pretty fast, but I still believe that the idea with using all 64 sprites for the logo, and then scrolling the background is doable, and would yield a nice result. Well, what I settled on was little white dots on a transparent background. I like to think of them as stars, and then we are still having a sky theme for the demo/intro screen, haha. Anyway they move vertically once pr. frame, some by one pixels, others by two pixels. I realized that I really needed at kind of frame-based program flow, like the one you can have with vblanks enabled and an interrupt handler. But I thought that I had better to keep out of the game's interrupt handler, because that I would not like my modifications to slow down the game. And I believe that this would be the case if I hijacked the interrupt handler to have it accomodate to my custom needs as well as handling things for the game. As you might know, the last thing Golden Axe needs is more tasks to be carried out on a frame-by-frame basis (here I'm alluding to the sometimes chubby flow of things when three enemies are on screen with you). Studying the various ressources on SMS Power!, including some of the open source demos, I learned how to create a frame-by-frame flow without having to turn on interrupts and using a handler. I found out about this counter in Charles McDonald's VDP documentation. Also it was obvious that something related to the screen/level was connected to bytes at $C002 and $C003. When everything about the demo screen and trainer menu is done, and the user clicks either "GAME" from the demo screen or "START GAME" from the trainer menu, the program returns to the demoScreenCaller above, reinserts the correct page in slot 1, and carry on with preparing everything for the original title screen. After the "Select magic" screen, I need to check at which level the player wants to start the game. As far as I can see, the original 512 kb's of ROM do not have enough unused bytes within it for these modifications. So I need to put the functions into the appended space, and I need to jump to this space on the occasions mentioned above. Unused space is scarce within the original ROM, so instead of having three separate caller functions (they use quite a few bytes, as they also handle paging), I have a kind of router function used by all three occasions. This router function jumps to the appended space, where register A is used as a kind of parameter, routing the program flow towards either handling level, lives or potions depending on the value in A. Please download and explore the source included in the .zip file below. I have tried to add plenty of comments to the code. Included is also an .ips patch so that you can almost one-click recreate the complete trainer hack described here. ^ See ProActionReplay for more information.